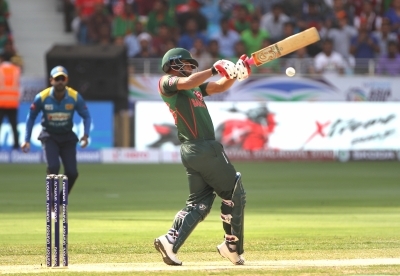 Dubai Sep 15 (IANS) Bangladesh opener Tamim Iqbal has been reportedly ruled out of the Asia Cup after fracturing his left wrist during the tournament opener against Sri Lanka here on Saturday. Iqbal who suffered the injury in the second over of their innings is likely to be out of action for at least six weeks. "We took him to hospital only because it was a serious injury and not just mere bruising " Minajul Abedin the Bangladesh chief selector was quoted as saying by espncricinfo. "He was in some pain obviously and it wouldn t have been prudent to continue batting." Iqbal was hit on his left wrist while attempting a pull against Suranga Lakmal in the second over and was taken to the hospital where scans revealed a crack on the outside of his index finger. The southpaw however surprised everyone by returning to the crease at the fall of Bangladesh s ninth wicket in the 47th over to give company to centurion Mushfiqur Rahim who almost single-handedly guided the side to a fighting 261 with his highest ODI score of 144.